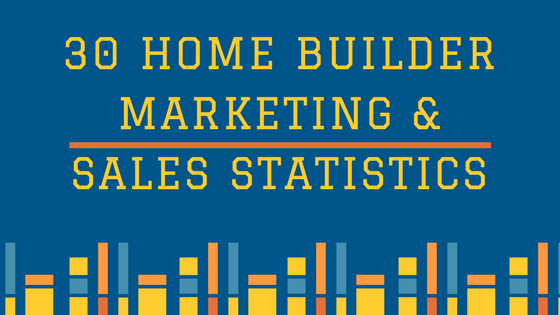 The 2018 State of Home Builder Marketing Report is now live. Download your free copy today! 1. 67% of home builders #1 marketing challenge is converting leads to customers. 2. 26% of home builders said a top marketing challenge was managing the website. 3. 61% of home builders said a top marketing challenge was generating traffic and leads. 4. 76% of home builders said a top priority of growing SEO/organic presence. 5. 37% of home builders plan to add Facebook video to their marketing strategy in the next 12 months. 6. 38% of home builders generate a higher marketing ROI through inbound marketing. 7. 73% of home builders primary approach to marketing is inbound marketing. 8. Inbound marketing provides the highest quality leads for 53% of home builders. 9. Only 9% of home builders generate more than 50 leads per month from their website. 10. Only 33% of home builders use marketing automation software. 11. Over 50% of home builders get less than 500 visitors per month to their website. 12. 56% of home builders don't actively document marketing ROI. 13. 23% of home builders said a top marketing challenge was proving ROI. 14. 43% of home builders increased overall marketing budget vs. last year. 15. Only 6% of home builders decreased marketing budget vs. last year. 16. 41% of home builders increased budget for inbound marketing vs. last year. 17. 50% of home builders say paid advertising is the most overrated marketing tactic. 18. 40% of home builders plan to add YouTube to their marketing strategy in the next 12 months. 19. 40% of home builders plan to add Instagram to their marketing strategy in the next 12 months. 20. Only 10% of home builders publish to social media daily. 21. 67% of home builders feel their marketing strategy is effective. 22. 44% of home builders write their content in-house. 23. 26% of home builders use an agency to write their content. 24. Only 12.5% of home builders blog 5 or more times per month. 25. 60% of home builders use a CRM. 26. Home builders biggest sales challenge is qualifying leads. 27. Only 20% of home builders have social media info on a lead before a sales person reaches out. 28. Only 23% of home builders have web interaction history before a sales person reaches out. 29. The biggest CRM challenge for home builders is under-usage. 30. 53% of home builders handle leads from digital on a first come, first serve basis. Home builders have some big challenges around generating leads and qualifying leads. Technology is also a big hurdle for home builders, especially when it comes to CRM and marketing automation software.